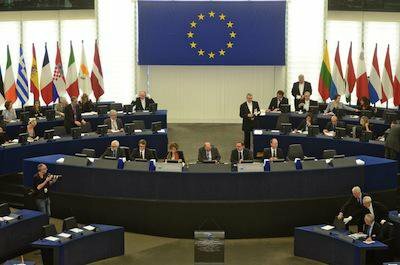 Stefan Collignon responds to 'Against the European Parliament', authored by Lorenzo del Savio and Matteo Mameli. A European representative government is the best way out of the crisis. 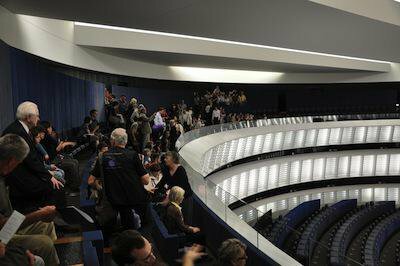 Session at European Parliament in Strasbourg. Demotix/Serge Mouraret. All rights reserved.Europe is suffering from excessive austerity. Many people believe that policies must change. Even President Obama has said: "You cannot squeeze countries in the midst of depression". Yet there are also those who argue that bitter medicine is necessary to get out of the crisis. Such opposing views are legitimate and ought to be part of a vibrant democracy. But Europe is not a democracy. It is governed by a complex system of rules and regulations agreed between nation states. Although people can elect new governments in their member states, European policies do not seem to change. In their frustration, voters switch to radical right and left-wing populist parties which are threatening to destroy the euro and ultimately the European integration project. One way to end the disease is to kill off the patient. Bringing Europe back to prosperity and full employment would require new economic strategies. The path is not easy. Even in the USA it took more than six years to reduce unemployment by half. However, in Europe political difficulties are overshadowing economics. The question is not only what policies would produce better results, but also how can the broad policy orientations be changed? The issue is democracy. The election of new governments in individual member states will not bring fundamental change to Europe as long as decisions are made by a collective of European governments. The nation state has become dysfunctional, because it raises hopes and expectations which cannot be fulfilled. Without tackling Europe’s fundamental problem, economic alternatives will remain worthless daydreams. In this essay, I will focus on the political obstacles which prevent Europe from changing track. Europe’s fundamental problem, especially in the monetary union, is its economic governance without a government. Some scholars have argued that democracy and having a government do not matter for the European Union, because the common policies are of secondary order and the important stuff is done by democratically elected governments. Others have warned that politicizing and democratizing the EU would lead to distributional conflicts which would reduce welfare. The best way to proceed, they propose, is to set up tight rules and regulations and let markets get on with what matters for everyone’s life. Yet realities have proven these thinkers wrong. The euro crisis has profoundly affected everyday lives of ordinary citizens and proven that the existing governance system has not worked satisfactorily. The reason for the prolonged economic slump is the dysfunctional combination of policy externalities, policy inconsistencies and political agency. Over half a century, the European Union has set up a fully integrated market with free movement for goods, services, people and capital, based on the argument that a larger and more efficient market economy is generating welfare benefits for everyone. If integration has caused some losses, nation states ought to compensate the losers out of these net integration benefits. All evidence confirms that European integration has substantially improved prosperity in the Union. However, distributional issues have never been part of the European agenda. The standard argument for integration is so-called Pareto optimality, which means net benefits from ‘more Europe’ are positive and no one is made worse off, but this theory is silent about the fact that some may reap greater benefits than others. Not surprisingly, the distribution of wealth and income has shifted in favour of the rich. Success breeds success. Nevertheless, all markets are embedded in broader contexts of norms, rules, regulations and laws. If nation states redistribute some of the integration gains to compensate the losers, they affect the competitiveness of those who seek to appropriate integration gains; national governments would therefore damage their own capacity to compensate the losers. Thus, every national government must therefore seek to improve national competitiveness and obtain a greater share of gains. But by pursuing such policies they affect not only their own but also the relative, and often also the absolute, competitive position of their neighbours. This spillover of policy measures taken in one member state into others is called ‘policy externality’. It means that what one government does affects more citizens than just those who have elected it. The logic of externalities has greatly increased in monetary union, because money is the hard budget constraint in any economy. This means money does not grow on trees; it is scarce. This fact is necessary for a well-functioning competitive market economy, because it forces producers to improve the quality of their products and services in order to earn money and improve market share. The euro is therefore an institution that helps raise long-run prosperity. But tight money also imposes constraints and externalities on national governments and their finances. To make it simple: if money grows at, say, four percent and governments’ aggregate public sector borrowing requirements are growing at the rate of five percent, private investment will be crowded out. If one government is running large budget deficits, other governments must reduce theirs in order to avoid financial markets pushing up interest rates, which would affect all member states negatively. Similarly, if one member state accumulates trade and current account surpluses, it pushes other countries into debt. Deficits cannot be reduced without simultaneously lowering surpluses elsewhere. Thus, by having the same money, all those who are using it are closely connected. 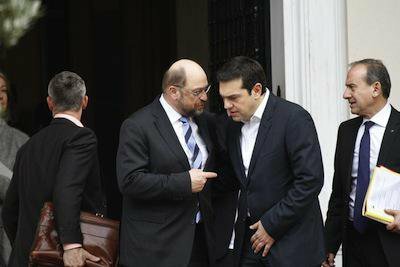 President of the European Parliament, Martin Schulz, and the Greek Prime Minister, Alexis Tsipras. Demotix/Michael Debets. All rExternalities are the inevitable consequence of integration. Their impact goes beyond national borders and affects every citizen. In pure market transactions each economic agent is autonomous. She decides what is good for her and the impact of her decision is infinitely small. But with externalities, this is no longer true. What may be good for me may be bad for you. Take the Karamanlis government in Greece: in order to win elections, Karamanlis broke Europe’s fiscal rules and this caused the euro crisis with negative effects for all citizens in the Euro-area. Take the Merkel government in Germany: in order to win regional and national elections, Merkel has resisted an early bailout of the crisis countries claiming that she was protecting German taxpayers. The resulting chaos in financial markets increased the cost of the final rescue and was bad for everyone, including German taxpayers. Take the new Syriza government: by threatening to unilaterally abandon contractual debt obligations, it risks the collapse of monetary union. In all these cases, the policy preferences of individual national governments were inconsistent with the interests of European citizens as a whole. Policy inconsistency is the biggest problem of the Euro-area. Luckily, there are some issues and areas where policy preferences of all governments converge. But there is no necessity for that. Before Maastricht, European integration was driven by what economists call ‘inclusive’ public goods, where the incentives to cooperate were strong and integration progressed in order to reap collective benefits. For example, the large internal market has generated economies of scale and productivity gains, which required the creation of a common currency because in the long run a single market cannot function efficiently with many different national currencies. The euro was the logical answer to this inconsistency. However, because money is the hard budget constraint, introducing the common currency has generated a new set of ‘exclusive’ public goods, where the benefits for one are the loss of another. This fact has changed the logic of policy making in Europe. The old idea that ‘we are all sitting in the same boat’ no longer makes sense. When policy preferences are diverging, as they are under the hard budget constraint, only a centralized government will be able to formulate and implement coherent policies. The argument goes all the way back to David Hume in the eighteenth century and has not lost its validity. How public goods ought to be administered depends on the nature of public goods. Inclusive goods can be supplied by voluntary cooperation or coherent rules with the help of an external impartial authority like the European Commission, but exclusive public goods need either very tough rules with strict penalties for deviating behaviour, or, especially if they require discretionary policy responses in a crisis, they need a proper government. But this poses new problems. Externalities create facts and conditions that all citizens of the Union share. And they create a common sense of being affected by policies that individuals can no longer control. They pose, therefore, new challenges for democracy. Neofunctionalist theorists of European integration have always argued that the integration process was destabilizing the old system of sovereign states and therefore required new institutions at the European level. This spillover logic is now affecting the nature of democratic government. If the coherence of economic and other policies requires centralized decision making, then this new step of integration is only acceptable if it is consistent with the fundamental norms of democracy. The modern idea of democracy, which dates back to John Locke, Immanuel Kant and the American and French Revolutions, has defined citizens as the principal and governments as their agent. Collectively, citizens are the owners of public goods, and as such they charge a government with the administration of what they have in common, but they also have the right to revoke it if they are unhappy with what the government has done. Choosing and dismissing a government is political freedom. Agreeing on what a government ought to do is political autonomy. However, it is clear that in the intergovernmental system of European policy making, citizens are neither free nor autonomous because they are subjected to the policy externalities caused by governments which they never have and never will elect themselves. Europeans share common European public goods, but they do not share the responsibility for how these goods are administered. Decisions are made by national governments which by definition cannot represent the interests of all European citizens. They represent the partial interests of the majority of national constituencies. Because national governments are elected in national elections, where European issues usually play only a subordinated role, there is no European-wide deliberation about desirable policy orientations. As a consequence, it is also impossible for European citizens to revoke the policy makers and change policy orientations at the European level. Take the recent Greek elections: voters have dismissed the conservative government of Antonis Samaras and put Alexis Tsipras into office. But the new Prime Minister still has to deal with the old heads of state and government. The margins for changing policy orientations are minimal. Either the new government finds a compromise with the other governments and betrays electoral promises, or it sticks to its programme and risks exploding the European Union. No wonder frustration is growing and eurosceptic parties are winning. So far, incoming governments have always behaved ‘responsibly’ and compromised with their partners, because that seemed to yield net budgets, but there is no guarantee that this will remain the case when local governments lose support at home. European Parliament Open Day, 2009. Demotix/Sebastien Riotto. All rights reserved.The solution to Europe’s fundamental problem is a European government with full democratic control, so that citizens can collectively change the policy orientations that affect them all. But this option encounters a problem: as the German Constitutional Court says, European democracy is impossible because there is no European demos. The populist version of the argument says that power must be decentralized and brought back to the ‘peoples’ (notice the plural!). I will argue that both these claims are mistaken. A European representative government is the best way out of the crisis. Objections to European democracy come in many forms, but they all boil down to a simple message: European citizens are not free and equal individuals who own common public goods, but citizens ‘belong’ to nations and are incorporated into states. The foundation of the state is ‘a people’ (note the singular! ), which has a common history, common beliefs, a common language, and a culture that guides them (what German conservatives call ‘Leitkultur’). According to this view, peoples’ identities are national, not European, and this prevents them from accepting that they might be outvoted in a democratic process. In other words, the identity of a people is a precondition of democracy. But what is national identity? In the 1990s, when there was a lot of resistance in Germany against giving up the deutschmark, the Commission President Jacques Delors said: “Few Germans believe in God, but all Germans believe in the Bundesbank”. This was funny, but false; to my knowledge Helmut Schmidt, the former German Chancellor, never believed in the Bundesbank. The point here is that talk of national identities always takes ‘pars pro toto’ (a part for the whole). A fraction of the people claims to speak for all and the minority is marginalized because the whole must be defended against the outside world. This holistic logic has dominated Europe’s history with catastrophic results. The same logic is still at work, when right-wing politicians wish to kick Greece out of the euro, or when demonstrators vilify Chancellor Merkel as a new dictator, or when populists claim that ‘the people’ are standing up against the ‘elites’. Modern democracy is built on pluralism and not on homogeneity, and this implies that citizens are ‘equal in their rights’ to freely decide how to govern their public goods. They do not need to be equal in their identity. How to define the demos is a matter of choice. Conservatives of all countries are united in making emotions and feeling the defining category. The alternative is to focus on interests. If citizens are the owners of common public goods, they have interests in how these goods ought to be managed. They have interests, often conflicting, in how to distribute the gains and benefits which derive from these public goods. And they need institutions through which they solve these conflicts. This is the purpose of democracy. European public goods constitute the common ‘res publica’, the European Republic. This republic is not based on shared feelings, nor does it represent an imagined community to which citizens belong. No doubt, Europeans have common feelings and share common values, but this is not a prerequisite for a common government. A government is a pragmatic institution set up to govern what belongs to citizens as owners of public goods. The European demos is, therefore, defined by the externalities of European public goods. There is a French demos which owns the public goods that affect all citizens living in France, just as there exists a Parisian demos that has an interest in how the city of Paris is run. In the same way, the European demos consists of all citizens who own and share the public goods which affect them all equally. These interests are more pronounced in monetary union, because the euro has generated many exclusive public goods and this is the reason why an economic government for the Euro-area is most urgent. 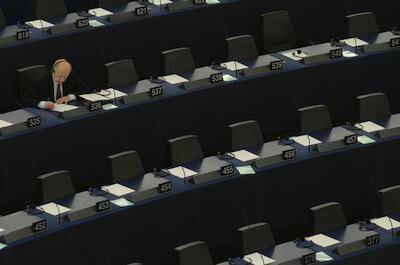 Absentee deputies at European Parliament. Demotix/Serge Mouraret. All rights reserved.How does a European government ensure democratic control of the management of common public goods? There are two models: direct and representative democracy. Direct means popular control, law making by referenda, and imperative mandates for elected representatives. These are concepts out of the toolbox of populist parties. There is something tempting about them. Populists promise to the powerless that they can rise and change the world. Vicious elites have captured the institutions of representative democracies, but ‘anti-repressive movements’ will seize power directly and prevail over the establishment. The model for this new bright model is ancient Athenian democracy, where everyone was involved in running public affairs. Little mention is made of the fact that it was the people of Athens who condemned Socrates and many other political unfortunates to death. But ancient democracy is hardly a way to govern the European Union. Modern liberty is guaranteed by representative democracies where free and equal citizens elect a parliament as a chamber for policy deliberation, the purpose of which is to produce coherent legislation. There are two major reasons why direct democracy is no solution for Europe’s fundamental problem of democracy. They both relate to the dangers of inconsistent policies. First of all, direct democracies increase policy inconsistencies because referenda are usually single-issue proposals. This introduces rigidities into the decision making process and prevents the design and implementation of coherent policies. California has a painful history of incompatible referenda, when one vote increases public spending and the next reduces taxes. Not even the Terminator Schwarzenegger could solve this puzzle. By contrast, in representative democracies, bundles of policy options are negotiated in parliaments and people can choose between policy programs that are more convincing if they are logically consistent. For example, voters prefer tax-and-spend over cut-and save parties. The inconsistent Californian policy mix would be more easily defeated in a representative parliament. Secondly, in large societies direct involvement by ordinary citizens is constrained by the complexities of policy issues. 200 years ago, Benjamin Constant had already pointed out that in modern societies with the advanced division of labour, individuals simply do not have time to be involved in every collective decision. He therefore saw the election of representatives charged to govern for a limited period of time as the modern solution to this complexity issue. However, some now argue that modern IT technology provides new opportunities for direct popular control because every citizen is free to participate in the electronic vote. The few examples we have are hardly inspiring confidence that this is possible. Internet consultations run by Italy’s Five Star Movement or the German Piraten Partei never achieved the threshold of significant representativity. Those who have the time and skills to participate will quickly and inevitably become ‘new elites’ that take decisions for the majority. If the complexities of large societies prevent direct popular control, another populist approach is to decentralize and destroy the large entities. Small is beautiful. Subsidiarity is virtue. But in a globalized world this means either a return to the Stone Age, or, more realistically, a rise in unregulated externalities. All politics may be local, but provincialism is not a virtue; it is a serious obstacle for liberty, equality, prosperity and an open society. By compartmentalizing European citizens into sovereign peoples, changing policies at the European level becomes less probable. Syriza has taught us within 24 hours of its victory that electing populist parties in nation states generates not less but more negative externalities. Ending austerity is a European problem, not a Greek one – even if Greek citizens have suffered most. Another example for the mismatch between compartmentalized national constituencies and European policy issues were the national referenda in four countries about the European Constitutional Treaty in 2005. Because in France and the Netherlands the majorities had voted ‘no’, the Treaty was abandoned, although the total number of votes in the four referendum countries had yielded a majority in favour of the Treaty. European citizens were out-gerrymandered by nationalists. So what kind of democracy should govern Europe? In representative democracies, citizens appoint a government as their agent. Political parties present alternative strategic plans, which ought to have a minimum of inner coherence in order to be credible. If the policies adopted do not work out, citizens can replace one government team by another. One may call this ‘choosing among competing elites’, but there is nothing reprehensible in appointing an elite if this means appointing ‘the best and the brightest’ to serve citizens’ interests. In the European context, the need to design coherent policies is absolutely crucial if the integration process is to yield welfare, prosperity and peace. This can only be done by a system of checks and balances. Citizens must be able to appoint and revoke their governments collectively and this makes the European Parliament the seat of democratic control, for this is the only institution that is subject to the universal suffrage of all European citizens. If a European government is necessary to manage European public goods, the European Parliament must be the institution that forms and expresses the will of European citizens. Proposals of creating an additional or even alternative body, a European Congress, to which members of national parliaments are delegated, is a step back into the tribal world of national identities. One standard argument against representative democracy at the European level is that it is too remote from ordinary citizens. Oligarchic elites are said to have ‘captured’ European institutions and are imposing policies that serve their own partial elite interest rather than the common welfare. However, it is exactly the other way round: the tight links between local elites and political representatives in the nation state are causing the gridlock and inconsistencies of European policies. Who was responsible for reckless bank lending in Ireland or Spain, if not local elites? Europe’s intergovernmental system is the perfect framework for protecting oligarchs and sustaining crony capitalism. James Madison, one of the authors of the American Constitution, made it clear in the Federalist Papers two centuries ago that a ‘large Republic’ with a federal government was a much better protection against agency capture by partial interests than the loyalty to local states that the Anti-federalists proclaimed. Populists on the left and right often claim that they wish to restore national sovereignty which has been transferred by powerful elites to European bodies outside popular control. This is a gross misunderstanding of what sovereignty means. The concept goes back to the early days of modern statehood, when absolute kings and rulers claimed to have the sovereign legitimacy to act as they wished. Yet absolutism merged and confused the notions of authority and power. Authority is the source of legitimate power. The sovereign has the authority to appoint a government to act on his or her behalf. Hence, states are never sovereign, because they represent the institutionalization of power, not authority. The Glorious Revolution in England shifted sovereignty to Parliament. The American and French Revolutions a century later proclaimed that ‘we the people’ are the sovereign and free to choose the representatives who make the law and protect individuals’ liberty, property and the pursuit of happiness. In the European context today, this means that, as owners of European public goods, European citizens are the sovereign with the right to appoint a government. If citizens are sovereign and free to appoint a legitimate government for the exercise of power, they have autonomy. They are, collectively, the source of the rules and laws which apply to them. They are not subjected to the externalities of what other governments do, but they decide freely what policies ought to be pursued in order to serve their interests. They are also equal in their right to change the broad policy orientations. This is what Europe needs. To sum up, European integration has made great progress in building common European public goods, which serve the interests of and provide net benefits to European citizens. These public goods are the foundation and source of European welfare and prosperity. The integration process has had its inner logic. For example, the single market is only sustainable with the euro as the single currency. Undoing it would deprive all citizens of these benefits. However, the present system of governance without government is not sustainable. With money as the hard budget constraint, centralized policy making becomes a necessity, but that is only legitimate if citizens have a choice over policy options. The European Republic is therefore a modern democracy that seeks to increase the liberty for citizens to change policies if they so wish, and it ensures the equality of all European citizens in making this decision. A European government does not guarantee that conflicts will not arise, or that no policy mistakes will be made, but it gives citizens a genuine choice over how to live. As Winston Churchill once said, “democracy is the worst form of government, except for all the others.” It is time for Europe to have a government.